All the streets from the villages of the state will soon illuminated with LED lights The Chief Minister of Andhra Pradesh state Mr.Nara Chandrababu Naidu has said that he would equip the streets of all the villages with the LED lights during the next one year. He made these remarks after launching the scheme to equip the street lights of the of the villages with less power consuming lights. The CM handed over some LED tube lights to the residents of Velagapudi and Mandadam villages in state capital Amaravati. Speaking on the occasion, he said that they would also ensure that all houses of the state has LED bulbs and tube lights. The CM said that he has already issued orders to the officials concerned to see that all the households of the state are equipped with the LED lights. Mr. Naidu noted that they need 30 lakh LED tube lights to equip all the streets of the villages and added that Rs.1200 crore investment was required to achieve their goal. The CM said that they consumption of power would come down by 40 percent due to the usage of the bulbs. The union government has already come forward to fund the prestigious project of the state government. The annual budget of Andhra Pradesh government will be presented on March 15, 2017 in state’s legislative assembly and legislative council. 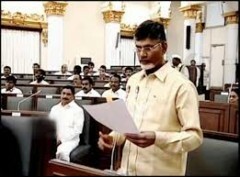 Although the state government has decided to present the budget in the two houses of the legislature on Monday, it was postponed toWednesday due to the sudden death of ruling Telugu Desam Party (TDP) leader and MLA from Nandyal assembly seat of Kurnool district from Rayalaseema region Bhuma Nagi Reddy following a heart arrest. The state government has also declared holiday to the two houses of the legislature on Monay following the death of the MLA. The two houses will meet on Tuesday and pay rich tributes to Bhuma Nagi Reddy before being adjourned for the day. It is for the first time in the history of the state’s legislature that the annual budget presentation was postponed by the state government after being scheduled to be presented on a certain day due to the death of the MLA. The state government has decided to present the budget on Wednesday after taking permission from Andhra Pradesh Governor ESL Narsimhan in the two houses of the state’s legislature. 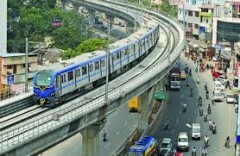 The works related to Vijayawada Metro Rail Project, the prestigious project of the state government led by its chief minister Mr. Nara Chandrababu Naidu, has received administrative approvals from the state government. The authorities will take up Rs.152 crore worth works under the project following this approval. The funds would be spend from the loan availed from Hudco at a low interest rate. The basic works under the project like construction of a bridge near alankar theater would be constructed with these funds by the authorities. The principal secretary of municipal administration and urban development department karikal valaven has issued the orders according the administrative sanction to the funds to be spent under the project. Andhra Pradesh Assembly Speaker Dr. Kodela Sivaprasad Rao has said that they were making full proof arrangements for the successful conduct of the upcoming budget session of the state’s legislature. He issued orders to officials concerned for making all the necessary arrangements for the purpose. The Speaker held two separate meetings with police officials and other department officials on the issue in his chambers in state capital Amaravati. Speaking on the occasion, he asked the officials to take all steps for the successful organization of the maiden budget session in the state capital. The speaker also took personal stock of the arrangements being made for the upcoming session by going around the assembly premises along with officials on the occasion. The budget session will formally commence on March 6 this month with the joint address of Governor of the state Mr. ESL Narasimhan. On March 7,2017 next day, the state government will move a motion of thanks on Governor’s speech in both the houses of the state’s legislature. The authorities are likely to declare holidays for the budget session by keeping in view of the ongoing MLC elections in the state from March 8, 2017 to March 12,2017. The budget of the state government is likely to be presented on March 13, 2017 by Mr. Yanamala Ramakrishnudu, the state finance minister. Andhra Pradesh Chief Minister and ruling Telugu Desam Party (TDP) National President Mr. N Chandrababu Naidu inaugurated state's Legislative Assembly and Legislative Council buildings in its capital Amaravati on Thursday. The two buildings located on the same premises were constructed in a record time of 192 days by the government authorities. Addressing a meeting organized on the occasion, the CM offered `Padabhivandanam’ to farmers who offered 32000 acres of land for the development of the state's capital in Amaravati. He said that he would develop Amaravati as a global city in the days to come and make the entire country proud of it. . Recollecting his 39 year long political career in Hyderabad, the capital of erstwhile AP state, Mr Naidu said that though it is annoying, he shifted to the new capital to speed up the development and completed the assembly buildings in record time. He said 9 cities and 27 townships would be developed with international standards in the blue and green city. He stressed on the need for promoting brand image of Amaravati. The Chief Minister further said that despite the deficit budget, the state government had achieved the first place in several priority sectors and won appreciation from one and all. Noting that the state suffered loss with unjustified bifurcation, Mr. Naidu said that Andhra Pradesh would be developed in a comprehensive manner. He said that special focus would be laid on development of Rayalaseema and North Andhra regions. Congratulating the CRDA officials for completing the construction of transit secretariat and Assembly complex in record time, the Chief Minister said walk to work culture would be promoted in the capital. He said world class educational institutions including medical institutions would be set up in the capital to develop it as an economic city. Earlier Assembly Speaker Kodela Sivaprasad Rao said that the legislative bodies play key role in fulfilling the wishes of people. AP Legislative council chairman Chakrapani, Minister for Finance and Legislative Affairs Yanamala Ramakrishnudu, Minister for municipal administration P Narayana spoke. 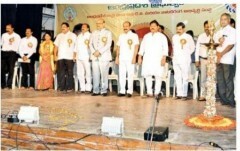 Union Minister P Ashok Gajapathi Raju attended the inaugural programme. Guntur district collector Kantilal Dande welcomed the gathering. MP Galla Jayadev, MLAs, MLCs, officials and farmers participated in the programme. prominent Telugu film actor and senior TDP leader Nandamuri Balakrishna has said that his son in law Mr. Nara Lokesh was completely eligible for the post of MLC. He said that the young leader had worked hard for the welfare of the party workers. The actor turned politician made these remarks while addressing media person in state capital Amaravati. Speaking on the occasion, he said that his son in law would also show the same amount of commitment and dedication in solving public problems. He noted that the responsibilities of Lokesh has gone up with the decision of the party to field him as the MLC under MLA's quota. Noting that Lokesh has inherited all the requisite leadership skills from his father and chief minister of the state Mr. Nara Chandrababu Naidu, he said that Lokesh would come up in politics It may be noted here that the highest decision making body of the party TDP Politburo has decided to field Mr. Lokesh under the MLC quota in the upcoming election. The young leader has thanked the party president for choosing him for the MLC post and assured the party leadership that he would work hard for the development of the party in the days to come. AP CM’s Son Nara Lokesh to enter Legislative Council as MLC! The political successor of Andhra Pradesh Chief Minister and ruling Telugu Desam Party (TDP)’s national president Mr. Nara Chandrababu Naidu and the party’s General Secretary Mr. Nara Lokesh will finally enter AP Legislative Council, the upper house of State’s Legislature, as MLC. The TDP Politburo has decided to field Mr. Lokesh as party candidate in the upcoming MLC elections under MLA’s quota. The meeting, which was held under the leadership of party president Mr. Naidu, at his residence in Undavalli, took up a discussion on the issue of nomination of party candidates in the upcoming MLC elections under MLA’s quota. The politburo has unanimously resolved to entrust the responsibility of choosing the party candidates on the shoulders of party president Mr. Naidu. The meeting has also passed a unanimous resolution to this effect stating that the party president was capable of taking a decision on the issue . Speaking on the occasion, Mr. Naidu told the meeting that they have undertaken an exercise to choose the party candidates based on the interests of all sections of society. The name of the Mr. Lokesh was proposed by the president of party’s AP unit Mr. Kala Venkat Rao as MLC candidate in the upcoming elections. The proposal received complete support from all the members of the politburo. The politburo member and party MLC Somireddy Chandramohan Reddy, speaking to media persons later said that the meeting had decided to field Mr. Lokesh as MLC under the MLA’s quota in the upcoming elections. The highly placed sources from the party have revealed that Mr. Lokesh is likely to be inducted in state cabinet after his election as the MLC. AP Govt to provide unemployment wage to jobless youth! Andhra Pradesh government is moving towards fulfilling its poll promise of providing dole (unemployment wage) to the unemployed youth of the state. The politburo, the highest decision making body of the ruling Telugu Desam Party (TDP), has decided to fulfill its poll promise finally. It has asked the state government to take steps to fulfill it at the earliest. It has decided to provide Rs.1000-Rs.2000 based on their educational qualification and other eligibility conditions. It has also decided to use the services of all the beneficiaries of the unemployment wage in social service programs. The meeting was held under the chairmanship of party’s national president and AP Chief Minister Mr. Nara Chandrababu Naidu at his residence in the state capital Amaravati. The meeting has also decided to construct ten lakh houses to all the homeless families of the state and asked the state government to complete the construction works before 2019 assembly elections. The politburo has also decided to implement another poll promise of establishing NTR canteens in the state. It has decided to set up the canteens in all municipal corporations of the state in the state. The meeting has taken up discussion on 17 issues. Some of these issues are welfare and development prgrammes being implemented in the state, attacks on Telugu people in the US etc. The details of the meeting were revealed to Media by party leaders S.Chandramohan Reddy, Ravula Chandrasekhar Reddy and Kalva Srinivasulu. They said that the meeting had congratulated the state government for the successful organization of Investors’ Summit and National woman’s Parliament in the state. It also expressed its pleasure over the execution of Rs.10.55 lakh crore worth MoUs during the investors summit in the state. The ruling Telugu Desam Party candidate from West Rayalaseema Graduate MLC Seat Mr. KJ Reddy has left behind all competitors in the ongoing election campaign. The statement made by him that he would not take single penny from the state government if elected as the MLC from the seat and would donate all his salary amounting Rs.1.08 crore for the welfare of the unemployed youth of the state has created ripples in the entire Andhra Pradesh. Several political analysts from the state have said that the sensational statement made by Mr. Reddy has endeared him to all the unemployed youth of the state. They have also said that the statement of the TDP candidate is giving sleepless nights to his political rivals in the elections. 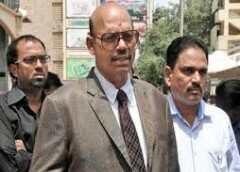 The statement has also helped Mr. Reddy garner the support of all sections of society. This was evident during the recent nomination submission programme held in Anantapur town. The event saw the participation of not only the state cabinet ministers, MPs, MLAs and other public representatives from the three districts of viz. Kadapa, Kurnool and Anantapur districts of the state but also general public from all sections of society in large numbers. The people have participated in the program voluntarily to express their support to the candidature of Mr. K.J. Reddy. Speaking on his election campaign Mr. Reddy has expressed his utmost satisfaction and said that the various development and welfare programs initiated by the state government led by chief minister of the state Mr. Nara Chandrababu Naidu would help him in securing a grand victory in the elections. A total of 25 candidates are in the fray from the graduate MLC seat. contesting as ruling Telugu Desam Party (TDP)’s candidate from West Rayalaseema graduate MLC seat, filed his nomination papers on Monday in Anantapur Collectorate. The incharge minister of Anantapur Mr. Kollu Ravindra, state cabinet ministers from the district Mr. Palle Raghunatha Reddy and Paritala Sunitha, MPs, MLAs BK Parthasarathi,Unnam Hanumantharaya Chowdari, Jayanageswara Reddy, S V Mohanreddy, Mayor Madhamanchi Swaroopa, Govt Chief vip Kaalava Srinivasulu, Yaminibala, ZP Chairman Chamansaab, Rajyasabha Member T G Venkatesh, Minister K E Krishnamurthi brother K E Prathap and party leaders from Kurnool, Kadapa and Anantapur districts took part in the nomination submission ceremony. The event preceded by a massive bike rally organized by Mr. KJ Reddy. The rally was kick started from the Anantapur District TDP office and traversed through Tower Circle and Saptagiri Circles of the town before reaching the district collecterate. It was led by TDP Telugu Yuvatha wing’s District President Tammineni Pavan Kumar. Later, Mr. KJ Rreddy submitted his nomination papers to Anantapur district collector in the presence of the ministers Mr. Kollu Ravindra, Palle Raghunatha Reddy and Partiala Sunitha and party MLAs. Earlier, Mr. KJ Reddy paid floral tributes to the statue of party founder and former chief minister NT Rama Rao near Arts college in the presence of the ministers and the party leaders, Addressing media persons after the submission of the nomination papers, the ministers hoped that the development programs being implemented by the chief minister of the state Mr. Nara Chandrababu Naidu would help in ensuring the victory of the party candidates in the upcoming MLC elections. They said that the CM of the state had been striving hard for all-round development of the state and added that the focus of Mr.Naidu was on driving out the problem of unemployment completely from the state. They said that several companies have already set up their units in the Andhra Pradesh thanks to the efforts of Mr. Naidu and added that the establishment of these companies would help the unemployed youth from the state in securing jobs. They further added that the CM was also trying hard to ensure the development of all sections of society in an equal manner. The ministers have prophesized that the people of the state would vote for all the party candidates and ensure their victory in the upcoming elections. Former Minister and ruling Telugu Desam Party (TDP)’s Rajya Sabha MP,TG Venkatesh has called upon eligible voters of the upcoming polls for West Rayalaseema’s graduate MLC seat to vote for party supported candidate Mr. KJ Reddy and ensure his victory. He said that the victory of Mr. Reddy was very important for the development of the Rayalaseema region in the state. He made these remarks while addressing a press conference along with party candidate Mr. KJ Reddy in Kurnool town. Speaking on the occasion he said that Mr. KJ Reddy was already a renowned entrepreneur from the Rayalaseema region and added that he did not have any faction background like many of the politicians from the region. He said that the election of Mr. Reddy was very important for the all-round development of the West Rayalaseema region in the state and assured the voters that Mr. Reddy would work hard for its all-round development. He told the voters that the regions of any state would witness development if they vote for the right candidates in the elections. Speaking on the occasion Mr. KJ Reddy said that he would move forward with the help of all sections of society and work hard for the all-round development of the Rayalaseema region. He urged the voters and party workers to extend their complete support to him and work hard for his victory in other districts of the Rayalaseema which are going for elections like they were doing in the Kurnool district. He revealed that he would file his nomination on Monday (February 21,2017) and urged the party leaders and workers to take part in his nomination submission program in large numbers. The media conference was attended by KDCC District president Mallikarjuna Reddy, Christian Cell president Babu Raju and party leader Hanumantha Rao and others. Prime Minister Narendra Modi to inaugurate Kurnool Solar Park? Prime Minister Narendra Modi is likely to inaugurated the Ganisakunala Solar Park being constructed in Kurnool district from Rayalaseema region of the state. This was revealed by Ajay Jain, the principal secretary of energy, infrastructure and investments department of the state. He said that they were trying to complete the works of the solar project as soon as possible by keeping in view of the possibility of its inauguration by none other than the Prime Minister of the country. He made these remarks while reviewing the progress of the solar project works at a high level review meeting held at Velagapudi located state of secretariat. The meeting was attended by the officials of Andhra Pradesh Solar Power Corporation Private Limited Adisheshu, VSR Naidu, AP New, Renewable Energy Developemnt Corporation of Andhra Pradesh (NREDCAP) M. Kamalkar Babu and AP Transco Co-Director Subramanyam. Speaking on the occasion, Ajay Jain said that the solar park has 1000 MW capacity. He asked the officials to take all steps to complete the project works at the earliest. Jain also asked the officials to take steps for commencing the works of other proposed solar power projects in Galiveedu and Mailavaram mandals of another Rayalaseema district Kadapa as soon as possible. He wanted the officials to achieve 2000 MW of installed capacity of solar power by the month of May 2017. In a fresh development, as many as 9 IT companies have commenced their operations in the city. Andhra Pradesh Chief Minister Mr. Nara Chandrababu Naidu has inaugurated the IT companies located at Indwell towers in Autonagar area of the city. Addressing a gathering on the occasion, Mr. Naidu thanked the managements of the companies for setting up their units in Vijayawada. Expressing his happiness over the inauguration of the IT companies , he said that the newly inaugurated IT companies would provide employment to 650 professionals from the city. He said that the establishment of the Nine IT companies in the city was just the beginning of a new era in the history of Vijayawada city and added that more number of IT companies are keen on establishing their units in the city. Naidu reiterated that his sole objective was to make Andhra Pradesh state as the number one state in the entire country. He also said that he would develop the state capital Amaravati in the similar manner as he developed the present capital city of Telangana state, Hyderabad. The MLC candidate of ruling Telugu Desam Party (TDP) from Kurnool, Anantapur and Kadapa Graduate Seat Mr.KJ Reddy has announced that he would donate his entire salary of Rs.1.08 crore for the welfare of unemployed youth of Rayalseema if elected to the post after the upcoming elections. He said that he has decided to not take a single rupee from his salary after his election as MLC to help the unemployed youth of the region. Mr. Reddy also said that he would use the money so donated in activities like extending financial help to the unemployed youth in applying for various government and private jobs. The TDP MLC Candidate made this impromptu announcement when a person asked him ‘if he is also coming into politics to earn huge amount of money? Prompt came the response from Mr. Reddy, who has already proved himself as the successful entrepreneur from the Rayalaseema region. “I will not take a single rupee from government, not even my government salary which amounts to Rs.1.08 crores, for a tenure of 6 years,” Mr. Reddy replied in assertive voice to the question posed by the youngster setting a live of example of how politicians should be in public life. His announcement has also once again reiterated his commitment for the welfare of the society and his unwavering desire to serve the society especially the people of Rayalaseema region without expecting anything in return. “I have earned everything as an entrepreneur. Public Service is all I want to do now. Politics is just the right platform for me to serve the people of my region,” he said while reiterating his commitment for the all-round development people of Rayalaseema . Mr. KJ Reddy is perhaps the first politician in the entire country to make such an announcement of donating his entire salary for the welfare of the unemployed youth of the Rayalaseema region. By doing so, he has also become a classic example to all politicians whose only goal in life is to make money from the day of their entry into politics. There is a good news for all the homeless residents of urban areas of Andhra Pradesh state. The state government has come up with a new housing scheme to equip all the homeless urban dwellers with own houses. It has decided to sanction new houses to all the homeless families by taking Rs.1000 as their initial contribution. The state government will equip loans from banks to all the beneficiaries with an option of easy installments to bear the remaining cost of the construction of the houses. The beneficiaries will get Rs.3 lakh subsidy from the state and central government s under Prime Minister Awas Yojana (PMAY) The state cabinet which met under the chairmanship of AP Chief Minister Mr. Nara Chandrababu Naidu has approved all the proposals related to this scheme. The houses will be constructed in modern gated community format. The gated communities will be equipped with basic amenities like drinking water, electricity and roads. They will also have other important facilities like hospital, commercial complex, community hall on its premises. The state government will set up a society to maintain the gated community. The state municipal administration and urban development minister Dr. P. Narayana has said that they would deposit Rs.30,000 with the society on the name of each house to look after its maintenance. The houses will be constructed in three different formats ( area wise). The first type of the house will be spread over 270 sq.ft. consisting of a hall, bed room. The second type of house will have 365 sq.ft area consisting of separate hall and bed room. The third type of the house will have 420 sq.ft area consisting of two bed rooms, hall. The minister has said that all the three types of houses will have separate kitchen and toilet. The beneficiaries has the option of equipping their houses with tiles and putty. The homeless families who want to opt for 270 sq.ft house have to pay Rs.1000 and those who want to opt for 365 sq.ft house have to pay Rs.25,000 to the state government and Rs.50,000 if they want to equip their houses with all modern facilities The families which want the 420 sq.ft house with all modern facilities will have to pay Rs. 1 lakh as their initial contribution. The minister has said that the state government has decided to invite tenders in all the districts which do not have MLC election code within the next four days. He said that they would seek the permission of the election commission to invite tenders in all the MLC election bound districts . He said that they would initiate the house construction process in the MLC election bound districts from the month of April if they did not get permission from the election commission to commence the works immediately. 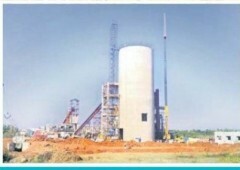 Deputy Chief Minister KE Krishna Murthy, who is also holding the portfolio of Revenue Minister, stated that the West of Kurnool district will become drought-proof area as the water schemes including Pandikona, Siddapuram and Pulakurthi are under progress and going to be inaugurated by Chief Minister N Chandrababu Naidu in March. He said that the new water schemes will help in providing irrigation water to one lakh more acres of land in the district. The Revenue Minister also reviewed widening the Handri Neeva Sujala Sravanthi (HNSS) canal and also the steps to be taken for filling as many as 106 minor irrigation tanks. The ancient rock paintings at Ketavaram are set for a major facelift with State government giving nod for creating an amusement park at an estimated cost of Rs.50 lakh. Ketavaram is home to prehistoric rock paintings of animals. There are around 42 rock paintings. This is one of the reasons why the tourists are getting attracted to this place. "In a bid to strengthen the tourism infrastructure and to attract more national and international tourists, The Government has drawn up plan at a cost of Rs 5 crores." At Sunkesula dam, the department proposes to provide a boarding facility, floating jetty and a snack bar along with ticket counter at a cost of Rs 1 crore. "They have already identified two acres of land at the site. The Narasimha Swamy Temple at Urukunda village in Kowthalam mandal is another site that the tourism department wants to give a big boost. It is proposed to construct a dormitory, a restaurant and public toilets at this Rs.50 lakh. Similarly, planned at place at a cost of a dormitory was Yellarthi Dargah premises in Holagunda Mandal. The department has proposed to construct a restaurant besides providing water facility at a cost of Rs.50 Lakhs. The lack of proper eatery at Yellarthi is another drawback for the place as a tourism centre. "The enchanting Valmiki caves at Boyavandla Palli in Peapully mandal were shortlisted for providing internal and external steps. Illumination of caves, waterfalls and a snack bar is on the cards," the tourism officer informed. Boating facility, floating jetty, a snack bar along with a booth for a ticket counter and play items for children are to be provided at Gajula Dinne Project at Ironbanda village in Gonegandla Mandal. Construction of dormitories, public toilets and snack bars are also proposed for Sangameshwara Temple and RS Rangapuram Maddileti Swamy temple at a cost of Rs.1 crore. Recently Both the Telugu states complained about the usage of Krishna water to the Krishna Board. So the Krishna board management (KRMB) has ready to measure Krishna river water use to comply with the transparency. For this purpose on wednesday and Thursday the board is visitng the places to take the decision for using the tele meters. What is the use for Rayalaseema with this Telemetry..? The Telemetry will provide the perfect estimation of the water usage of the krishna river. While there are two types of metrics for caluculating the water usage, stored water will be measured in Cubic feet and the flowing water will be measured in Cusecs. Where are these telemeeters will come..? The telemetries will be set on the Telugu ganga, SRPC, Muchhu marri irrigation Scheme, Handrineeva, Sunkesula, LLC bridge that are linked with the Bankacharla Cross regulator in the boarder of andra and Seema. To encourage Telugu Drama sector the AP government has started Nandi drama fairs. Kurnool city became the place for the Nandi Drama fairs conducted under the State Telugu Film, TV and Drama Sector's Combined organization. This fairs are started in kurnool TGV auditorium. In this festival district celebrates, Political Leaders, MP TG Venkatesh, MLA SV Mohan Reddy, Municipal Commissioner Raveendra Babu,Marketyard Chairman Shamanthakamani, Former Law Minister Prathap Reddy, MLCs Shilpa Chakrapani Reddy and Sudhkar Babu were attended for the inauguration the fairs.In the fiars on this occasion TG Venkatesh said, it is proud to start Nandi Drama fiars again in Kurnool after a long time, and he added this fair will be celebrated by representing the Rayalaseema Culture and traditions. The Municipal Comissioner Raveendra Babu said, Shakespeare wrote great plays in the drama that has been applied to the real life. Speaking on this occasion Kurnool MLA SV Mohan Reddy said the live streaming of the acts will be promoted on Siti Cable and the govt will approve and build 10,000 houses for the Drama artist in the scheme of House for Sale in the one area. The lakhs farmers from Andhra Pradesh state have received a Sankranti gift from their Chief Minister Mr. Nara Chandrababu Naidu. The CM has announced that the state government would supply Energy Efficient Pump Sets (EEP) Worth Rs.37,000 free of cost to all farmers of the state. He said that they would install 2 lakh new pump sets in the place of existing old pump sets by the end of 2017. He said that the state government was incurring Rs.22,000 per annum towards the power subsidy on each pumpset of the state. Mr. Naidu made it clear that he and his government were committed for the overall development and welfare of the farmers of the state. “I am Committed for the Welfare of the Farmers in the State. I strongly believe that a satisfied farmer is the lifeline of the State Economy. The Government is determined to improve the socio-economic conditions of the farmers through infrastructural, technological and financial support systems. State Govt is extending around Rs 22,000 per Annum to each pumpset as subsidy for extending free power to the farming community. Apart from that, the State Govt. within a short time is commencing the unique scheme, first of its kind in the Country, of distribution of Energy Efficiency Pumpset (EEPS) which costs around Rs.37,000 at free of cost to the Farmers. The pumpset comes with a benefit of 5 years warranty and my beloved farmer is eased of the burden of cost of maintenance of the pump set for 5 years,” he said in an open letter written to all the farmers of the state on the occasion of Sankranti festival. The letter was released to Media by Mr. Ajay Jain, the Principal Secretary of Energy Department of the state. In his letter, Naidu said that no. State Govt. in the Country was spending so much money on the welfare of the Farmers of the state. Talking about solar pump sets, he said that they have supplied 9400 solar pump sets to the farmers of the state so far. He said that Krishna district of the state had emerged as the number one district in the entire country by installing 1400 solar pump sets in its limits and added that Vizianagaram district had secured the second position in the list by installing 900 solar pump sets. Mr. Naidu revealed that they have decided to conduct an innovative “Meet and Greet’ program and added that each and every employee of the electricity department would call personally call on the farmers of the state as part of the program. The Krishna Water from Gandikota irrigation Project to Pydipalem Reservoir in Pulivendula has been released by AP CM Chandrababu Naidu. The most awaited Dream of Pulivendula residents of Kadapa District, the water release of Krishna river to Pydipalem Reservoir has come into reality by the launching of Gandikota irrigation project today 11-01-2017 by C.M Nara Chandrababu Naidu Garu. This is the Farmers dream of Decades and it has fulfilled today by the Release of Krishna water. The project will give the water to more than 1lakh acres and also the drinking water to Pulivendula, Prodduturu, Jammalamadugu, Kamalapuram constituencies in Kadapa district. In Kadapa at Press Conference in TDP office, the TDP MLC Candidate K.J.Reddy of West Rayalaseema said, Rayalaseema will be developed only with TDP. Seema used to face 3 major problems that are Water Harvesting, Drinking water and Unemployment. The drinking water problem has almost solved and water for Farming has been solving with the hard work and efforts of CM and Other TDP Leaders. So the remaining major problem is Unemployment. To solve this problem the Government is establishing the industrial corridors in each District. He also said in Kadapa the MOU is done with 8 mega companies and there is one more problem facing our youth that they are not having the required skills for getting the jobs. To resolve this problem k.J.reddy is coming up with the Skill development centers with help of Government. He added that the first preference votes of Graduates are very important, so the graduates should wisely think and vote for the TDP. Today CM Nara Chandra Babu Naidu laying foundations stones for various development works of 150crore. The other pending projects also getting approved for the next stages. The most popular festival of Andhra Pradesh people, Sankranti will be held in an official manner. The state government led by chief minister Mr. Nara Chandrababu Naidu has decided to celebrate the festival a state festival. It has released Rs.1 crore each to each of the 13 districts of the state including four Rayalaseema districts. The state government has issued orders to all districts collectors and asked them to celebrate the festival in an official manner in every village, mandal and district of the state. The festival will also be celebrated in Shilparamams located in Rayalaseema areas like Tirupathi, Kadapa and Puttaparti and coastal area Visakapatnam. Commenting on the decision of the state government, state information, IT and culture department minister Dr. Palle Raghunatha Reddy has said that the main objective behind celebrating the festival as a state festival was to allow all the people of the state to celebrate it with much vigor and fervor. He also announced that they would give awards to farmers of the state as part of the celebrations. “ Sankranti is the biggest festival for all Andhra People. The farmers celebrate to share their happiness of receiving a rich harvest every year. Keeping this in mind, the state government has also decided to give awards to the farmers,” he said . The minister added that all the villages of the state would burst into a state of joy during the Sankranti festival . Adding that that the popular festival would witness the performances by folk artists, cattle races and colorful bhogi mantalu (bonfire), Gobbemallu (fresh flowers placed on a handful of cow dung) and drawing of colorful muggulu (Rangoli) special fire, he said that the main goal of the CM of the state was to make all the women folk of the state the most happiest persons during the Sankranti festival. Mr. Reddy noted that they would conduct special Muggulu (rangoli) competitions for the women of the state as part of the celebrations. The minister revealed that they would also hold a grand Sankranti festival in state capital Amaravati in the presence of the CM. The minister said that they have sanctioned Rs.3 lakh to allow the employees of the state secretariat to celebrate the festival in a grand manner. The minister noted that they have decided to give away special Sankranti gifts to all white ration card holders as part of the celebrations. The minister thanked the CM for sanctioning special funds to celebrate the Sankranti festival in an official manner across the state. The promotion of industrial infrastructure to modernize under the state scheme (MIIUS) for Gollapuram, Tumakunta industrial hubs government has allocated Rs 50 crore. This amount will be used for the industrial infrastructure like roads, water supply, Drainage, fencing and other basic needs. The boom coming for both industrial hubs with these works which are in the process.The Govt APIIC has intended to attract the interested industries to these hubs by completing needful industrial infrastructure. Nearly Rs 500 crore heavy industries like Garments, textiles, iron, chemicals, drugs, and a variety of industry sectors to come. While more than 20 industries are already applied for Permissions, with an investment of Rs 500cr Surya Roshni, Tex port spinnings, Heritage Foods, Ratan plastic, Baliha Chemicals Industry works are going on at a rapid pace. In addition, more industries are likely to take place immediately after the establishment of infrastructure. The unemployed people in the hopes of employment with the establishment of these industries. More than 3000 job and employment opportunities will be generated by these industries. The people of Anantapur Dist. are expected to take to prevent the migration. Prime Minister of the country Narendra Modi on Tuesday inaugurated the prestigious 104th Indian Science Congress (IRC) conference in Rayalaseema town Tirupati. Andhra Pradesh and Telangana states Governor ESL Narasimhan, Chief Minister of the state Nara Chandra Babu Naidu have accompanied the PM during the inaugural ceremony. The event saw the participation thousands of scientists, researchers including six Nobel laureates from across the globe. Speaking on the occasion, he called upon the scientists to invent technologies and concepts that will create employment opportunities to the unemployed youth of the country without getting scared by looking at the challenges of a rapidly changing world. He mooted the concept of Scientific Social Responsibility (SSR) on the lines of Corporate Social Responsibility (CSR) and said that the science and technology department of the country and the scientists have the responsibility of improving the living conditions of all the people including those living in small villages of the country. Noting that there is a need to improve the standards of researchers, Modi assured the scientists that India will bag the third place in the field of science and technology by the year 2030. His inaugural address lasted for 40 minutes. The PM also said that the challenges being faced by the countrymen can be transformed into opportunities by leveraging new technological innovations like robotics, big data analysis, artificial intelligence, deep learning, quantum communications and internet of things. He said that the new emerging technologies can be effectively used in areas like agriculture, health, water, fuel, traffic Management, infrastructure provision, geographical information systems, security and economic fields. He announced that they would set up a national level mission to ensure inter-departmental coordination between all the important departments. In Kurnool C.M Chandrababu Naidu declared Amaravathi as Free Zone for Recruitment as a New year Gift.. In an appreciable move aimed at benefiting unemployed people, C.M Nara Chandrababu Naidu Garu on Monday declared Amaravati, the State capital as a free zone for recruitment. The society is like Place Full of flowers - In this place every flower will flourish , in the same way one person's individual development will help in the development of a family in result the state and County's all sectors will Flourish with Development. C.M Chandrababu Naidu has aimed for this Family Development and Starting a new Janma-Bhoomi Program with 15 principles. At this point of time Cashless transactions are the need of great importance to hold over the money crunch. 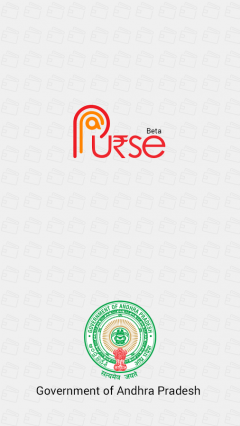 The Important Points you should know about "Ap Purse"
* In this App, 13 mobile banking and 10 mobile wallets were available in the purse to pay bills. *The government is also introducing "Marpu Nestam", an agent to educate the people on digital money literacy. *The government will pay incentives to the agents who train the people in digital financial literacy.” *The Government is encouraging Engineering students to train people. It would help them to earn while learning. *The government will recognize the services of the colleges and the students for their helpful service to society at the time of crisis. There is a good a news for hundreds and thousands of unemployed youth from Andhra Pradesh state especially for those belonging to Rayalaseema region. 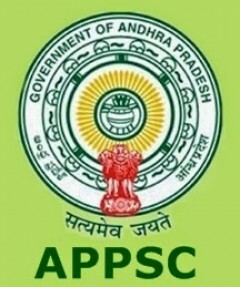 Andhra Pradesh Public Service Commission (APPSC) issued group-2 notification on Tuesday night. November 18,2016. The day is very important in the history of Rayalaseema region. It stood witness to the naming of the region as Rayalaseema by replacing the derogatory word ‘Ceded districts’. The name was given by famous social activist of the time Chilukuri Narayana Rao during the meeting of Andhra Mahasabha held in Nandyal on November 18,2016. Rao moved a resolution to this effect. It was seconded by the other members of the Mahasabha and was adopted unanimously. . Although, Rao belonged to Coastal region, he turned out to be the strong supporter of the rights of the region. After the naming of the Rayalaseema region, the member of the Sabha and noted social activist Pappoori Ramacharyulu played a crucial role in promoting the name Rayalaseema across the region. He used his publication, Sadhana, a prominent journal of the time, to promote the name- Rayalaseema. He also used to bring out "the Voice of Rayalaseema" page to promote it and make people to get used to it. The people and activists from the region have raised their voice against the derogatory Ceded district term under the banner of Andhra Mahasabha. The name ceded district began to be used during the British era as it was handed over to the British by the then Nizam’s of Hyderabad. The Nizam ceded the districts to the British as part of the subsidiary alliance struck between the two rulers. The Nizam got the Rayalaseema districts as its share after the Mysore war. However, the Nizam did not want to rule the area and decided to create a buffer with the help of the British rulers. The British readily agreed to the proposal made by the Nizam to bear the expenses of the subsidiary force from the revenue earned from the area. The region consisting of Anantapur, Chittoor, Kadapa, Kurnool and Bellary used to be referred as ‘Rayalaseema by the Britishers. Bellary was later merged into neighboring Karnataka state. The region presently has four districts viz. Kadapa, Kurnool, Anantapur and Chittoor districts. 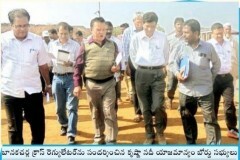 Orvakallu will become a Mega industrial hub soon in Rayalaseema..! Orvakallu mandal does not require any introduction in the Rayalaseema region especially in Kurnool district. It is now craving for the mercy of the rulers of the state. Orvakallu, which is just 18 away from Kurnool town, has shot to fame as the prospective industrial area of the Rayalaseema thanks to the announcement made by Andhra Pradesh Chief Minister Mr. Nara Chandrababu Naidu. He made the announcement while addressing a gathering after hoisting national flag in Kurnool on the occasion of Independence Day on August 14,2014. Speaking on the occasion, Naidu announced that he would develop the Orvakallu mandal into an industrial hub. Immediately after the announcement by the CM, the government revenue authorities have handed over 7214.87 acres of government land to Andhra Pradesh Industrial Infrastructure Corporation (APIIC). The officials of the corporation have urged the state government to accord permission for acquiring 2240.54 acres of private land. The officials told the state government that they would develop the industrial park 9455.41 acres of land. Keeping this in mind, the CM of the state again raised the issue and reiterated his promise of developing the industrial hub in Orvakallu during his visit of Kurnool town on November 4,2016 recently . However, no concrete action has been initiated by the authorities concerned to equip the park with basic infrastructure viz. roads, water and electricity. The officials of the corporation have submitted a preliminary report to the state government that it would require 40 tmc of water from Srisailam Irrigation project to provide water to the Orvakallu industrial hub. However, the Detailed Project Report (DPR) containing the details like how the water could be tapped and steps needed to be taken to provide the water facility to the industrial hub has not prepared by the officials. The prospective industrialists from the area are demanding the state government to take steps to create the basic infrastructure to the Orvakallu industrial park as soon as possible. Interestingly, over too small and medium entrepreneurs and industrialists from the area have already expressed their interest to set up their unit at the Orvakallu industrial park. More importantly, Hyderabad based steel producer Jairaj Ispat private limited has already come forward to make Rs.2935 crore investment at the park by setting up its industrial unit. The unit is expected to create direct and indirect employment opportunities to over 6000 people from the Rayalaseema region. The state government has already allotted 370 acres of government land near Guttapadu village in Orvakallu mandal. 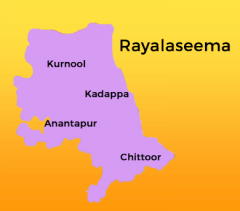 Here is a good news for the residents of Rayalseema region. The National Highways Authority of India (NHAI) has decided to build an 'Express Way to connect Andhra Pradesh state capital Amaravati with the Rayalaseema region. This was revealed by the Member (Technical) of National Highways Authority of India Dhananjay O.Thawade. He said that they would take up the construction of the Express Way under Phase VI of the project. He said that the the express would be build from Anantapur District of Rayalaseema with the state capital. According to Thawade, the construction of the express way will be taken up as part of the National Highway Development Project. He also said that they would construct four-lane roads from the other districts of Rayalaseema like Kurnool and Kadapa linking the express way. According to Ta-wade, the total length of the proposed express way project is 600 km. The construction of the express way will turn out to be a boon for the residents of the Rayalaseema region. It will help in reducing the time taken to reach the capital from the Rayalaseema region. October 1,1953, the day has been written with golden words in the history of Rayalaseema. The reason for this is that the union government had formed Andhra State with Kurnool, a district from Rayalaseema as its capital 61 years back. However, the conspiracies hatched by the rulers of the day had led to the shifting of the capital from Kurnool district to Hyderabad after the merger the princely state of Hyderabad into the Indian dominion three years later. The three year long rule of the Andhra state with Kurnool as its capital can be termed as the golden rule which gave a hope for a bright Rayalaseema. It has also gone down in the memory lane as an unforgettable event in the history of Rayalaseema. All important organs which are required to rule the state discharged their responsibilities from the Kurnool district during the three year long period. The state secretariat, Raj Bhavan, which is the official residence of governor of the state, State Assembly, Chief Minister’s Residence, MLA Quarters, the residence of Chief Secretary of the state were located in Kurnool district. The present day district court complex used to be the state Assembly in the Andhra state. Similarly, the present medical college used to be the state secretariat of the Telugu state. The present day STBC college was the official residence of the chief minister of the state. The present day town model college used to house the MLA Quarters. The presence of all the important organs of the state government gave a ray of hope to all the residents of Rayalaseema. They dreamed that their area would develop into the most prosperous region in the entire country. However, their dreams fell flat thanks to the shifting of the state capital from the Kurnool district to Hyderabad following the conspiracies by the rulers of the day. The shifting of the capital has had a terrible effect on the minds of the people as all their dreams were shattered. The fall of the region had also begun immediately after the shifting of the state’s capital and it is still continuing. Many thought that Rayalaseema would get a good package after the bifurcation of the state. However, the entire region had received a raw deal as the state capital was set up at Amaravati of coastal region. The demands of the Rayalaseema region to make Kurnool as the state capital after the bifurcation of the state did not have any impact on the rulers. Ananthapuramu, Apr 21 (PTI) Andhra Pradesh Chief Minister N Chandrababu Naidu today laid the foundation stone for the Elcina Raaga Mayuri Electronics Park at Chilamattur village in Ananthapuramu district in the Rayalaseema region of the state. The Park, which will come up on a 50-acre site on the National Highway close to Bengaluru, will be the largest electronics manufacturing cluster in the country, state government officials said. Taken up in collaboration with Electronic Industries Association of India (Elcina), the park will be developed by the KJR Group which has already entered into memoranda of understanding with several manufacturers for setting up electronic component manufacturing units for defence, aerospace and other sectors. Andhra Pradesh government has lined up three major projects to produce 2,500 MW of solar power in the Rayalaseema region of the state. A memorandum of understanding for these projects will be signed here tomorrow between the Government of India, the Ministry of Power and the Government of Andhra Pradesh in the presence of Union Power Minister Piyush Goyal and Chief Minister N Chandrababu Naidu. The state Cabinet, which met here today under the chairmanship of the Chief Minister, cleared the solar power projects as part of the 'Power For All' scheme being introduced from October 2. The NTPC will set up a 1,000 MW solar power plant at Kadiri in Anantapuram district with an investment of Rs 7,000 crore, according to state's Minister for Information and Public Relations Palle Raghunatha Reddy.